Bean Buro responded with a poetic design that integrated art with people and space. The narrative involved the research into the history of the site building Jardine House; its historical tea trading activities in the neighbourhood, and the iconic circular windows of Jardine House. Circular forms were once used in many oriental tea gardens as a symbol of tranquility and nature. The conceptual narrative has driven the design with a series of unique joinery elements, such as the work clusters installed with distinctive circular acoustic panels at each table end, as well as the rounded edging details of the tables in the meeting areas. 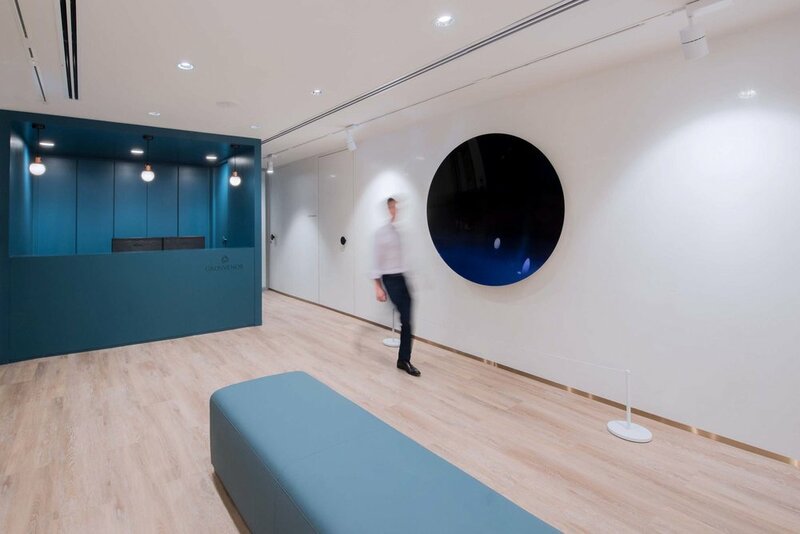 Bean Buro was tasked with designing a new workplace for the international British property group, Grosvenor, at the iconic Jardine House building in Hong Kong of approx. 5,000sqft (460sqm), to transform their previous workspace into an innovative workplace that would reflect the company’s belief for quality, integrity and social responsibility. The workplace would be open plan with a proportion of flexible seating with a variety of support spaces. Employees would be able to choose from a variety of work settings within the workplace depending on their needs. Acoustic design, lighting design, and the environmental strategy would be the key drivers behind the wellbeing and sustainable aspects of the project. The ethos was oriented around people, hence much of the priorities were given to the day to day user experiences. To heighten the sense of community, a formal art gallery was designed at the reception with high quality art that engages with all the employees and visitors. It featured contemporary art pieces such as Anish Kapoor’s Mirror (Black / Green to Cobalt Blue), 2016, and Nam June Paik’s Third Eye Television, 2005. The art interventions would engage with people, and these would in turn nurture a better company culture that is driven by the people in the workplace. The narrative of the circles, and circular forms, created a strong identity and a sense of place for the company. The conceptual narrative has driven the design with a series of unique joinery elements, such as the work clusters installed with distinctive circular acoustic panels at each table end, as well as the rounded edging details of the tables in the meeting areas. The workplace is fully equipped with human comfort designs for a more productive working environment. Employees from the open plan could choose to work in a variety of spaces, such as the informal focus rooms, phone booths, and pantry cafe. A wellbeing room is provided for relaxation. Each space is designed with lighting control sensors for the optimal lux level and light temperature. Acoustic solutions are inherent with in the architectural finishes to create a dynamic open plan environment, while ensuring the various meeting areas could achieve the required acoustic separations and absorptions to support a variety of private and open conversations. The visual lighting environment was designed with energy saving systems, while creating a visually legible space in play with a cohesive materials palette. Quantity surveyor: Gleeds (Hong Kong) Construction Consultant Co. Ltd.